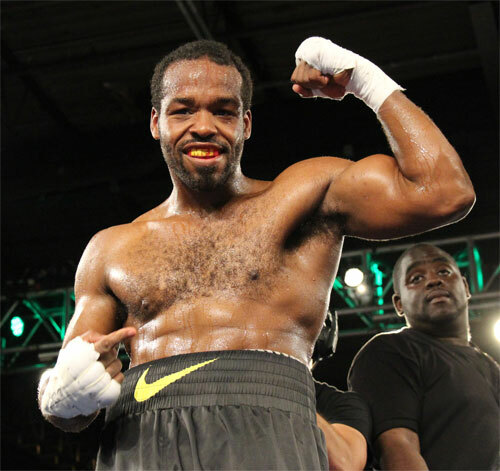 The brand new Tuesday Night Fights Pro-Am boxing series kicked off at the 2300 Arena in South Philly Tuesday night, and North Philly middleweight Fred Jenkins closed the show with a second round KO over Baltimore’s Jeremy Trussell in their scheduled 6-round bout. A total of three professional and six amateur bouts were contested. Jenkins looked sharp, winning the first round against his bigger opponent, before unleashing a vicious left hook in round two that decked Trussell flat on his back. Trussell made it to his feet, but Jenkins immediately jumped on him the moment referee Hurley McCall waved him back in. Not usually known for his punch, Jenkins turned killer and let loose a flurry of hard punches that put Trussell on the canvas again. The wounded fighter struggled to get up, but failed to beat the count. Referee McCall signaled the end at 2:52 of round two. 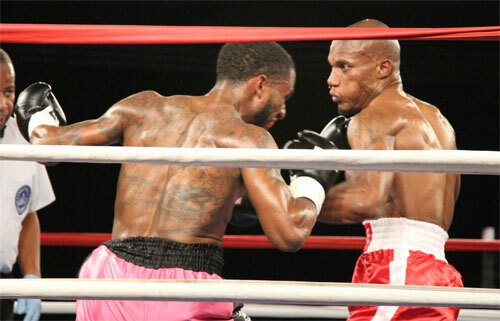 Jenkins improved to 8-1-1, 3 KOs, while Trussell fell to 8-2-1, 6 KOs. Middleweight Keith Downs (red & white trunks, above) posted his third win without a loss by beating southpaw Robert Sweeney by majority 4-round decision. Sweeney, of Sicklerville, NJ, landed a tremendous right hook in the first round, and took that frame on the scorecards. However, Downs, of Willingboro, NJ, rebounded well. He landed heavily in round two and kept throwing until the final bell, using his significant size advantage to control the rest of the action. After four full rounds, Judge Lynn Carter saw the fight a 38-38 draw, but she was overruled by John Poturaj and David Braslow who both scored it 39-37 in favor of Downs. The win raised Downs’ record to 3-0, 1 KO; Sweeney lost for the first time, 2-1. 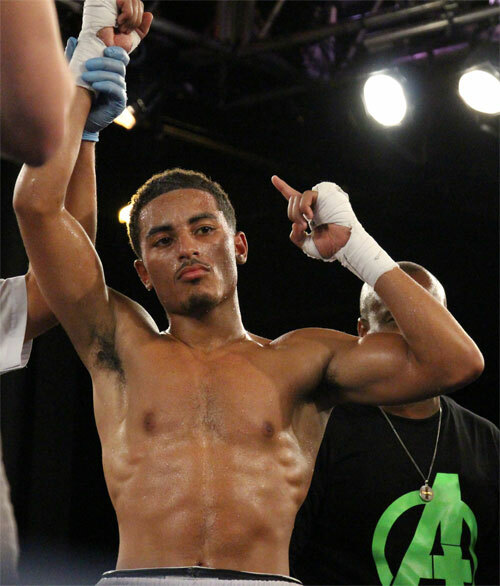 Philly lightweight Avery Sparrow made a successful pro debut against Antoine Knight, of Chicago, in the first of the professional contests. Sparrow, 1-0, landed just about everything he threw in round one, and repeated the feat most of the way in the following three rounds. He punctuated his performance with a big left hook just before the final bell. All three judges, Lynn Carter, John Poturaj and David Braslow scored the fight a 40-36 shutout for Sparrow. Knight slipped to 3-9, 1 KO. Christian Carto, Philadelphia, W3 Demetrious Young, Washington, DC - 110 lbs. Nahir Albright, Philadelphia, W3 Brian Walton, Camden, NJ - 141 lbs..
Johnathon Padilla, Reading, PA W3 Jesse Morell, Philadelphia - 123 lbs. Jackie McTamney, Philadelphia, W3 Kayla Hracho, Reading, PA - 125 lbs. Ray Ford, Sicklerville, NJ, W3 Adonis Camacho, Reading, PA - 112 lbs. Zahir Owens, Philadelphia, W3 Raul Serrano, Philadelphia - 120 lbs. The next edition of the Pro-Am series, promoted by Joe Hand Promotions and D&D Management, is scheduled for September 16th at the same venue.